Optional Single Supplement: $411 USD (number of singles limited). As the birthplace of western democracy, there is something strangely familiar to those who partake on our Greece guided tours. Perhaps it is the folklore, the monuments, or the legends that we have heard of over time that allows the traveller to feel both in awe yet at home while exploring this ancient land. Or perhaps it is that Greek hospitality and lust for life that oozes into every aspect of our Greece guided tours that leaves visitors filled with wonder. Whatever the case, guided tours of Greece have the right recipe for a classic journey full of history, arts, scenic landscapes, and memorable people. Although Greece does not occupy an overly large landmass, the vastness and richness of its history is overwhelmingly apparent. 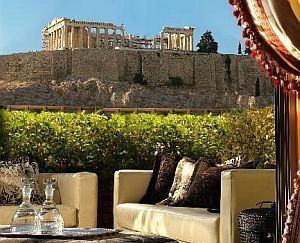 From the first sighting of the Acropolis in Athens, with buildings that date back to the 5th century BC, memories from the time of antiquity are readily available and easily accessed. 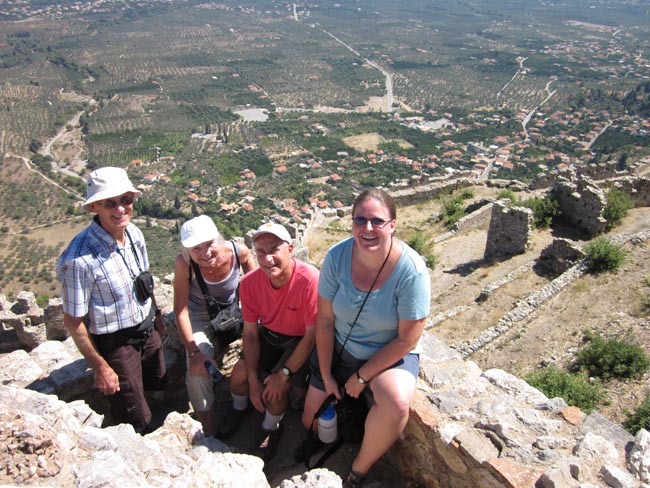 Learning from historians with a deep knowledge of archeology and philosophy, our Greece guided tours offer a small group experience with experts who engage our travellers with a fun yet informative approach to learning the vast saga of Greece. By exploring the remains of some of Greece's most rewarding sites such as the Temple of Apollo in Corinth, the Temple of Zeus in Olympia, or the sanctuary at Delphi, it is not hard to imagine the extensive power and prestige that Greece once held. Clues to their strength is also apparent with visits to Sparta, where the most formidable army in Greece once lived, or at the fortresses of Mystra which became a sanctuary of refugees who flourished within the impregnable walls during the middle ages as war and invasions surrounded this city. It was during the turmoil of the middle ages that Greece had a resurgence of culture, with the creation of churches of Meteora. Built on sandstone pillars of rock, these complexes which were built in the 11th century contain some of Greece's most important Eastern Orthodox monasteries. As with any Adventures Abroad small group tour, our Greece guided tours try to highlight the character of the country with trips to local restaurants at mealtimes and venture to places not usually found on the beaten path. Get your fill of delicious Greek food, such as moussaka, dolmas, and souvlaki while dining in locally owned tavernas, hosted and frequented by kind people keen to discuss their country in an informal manner over dinner. 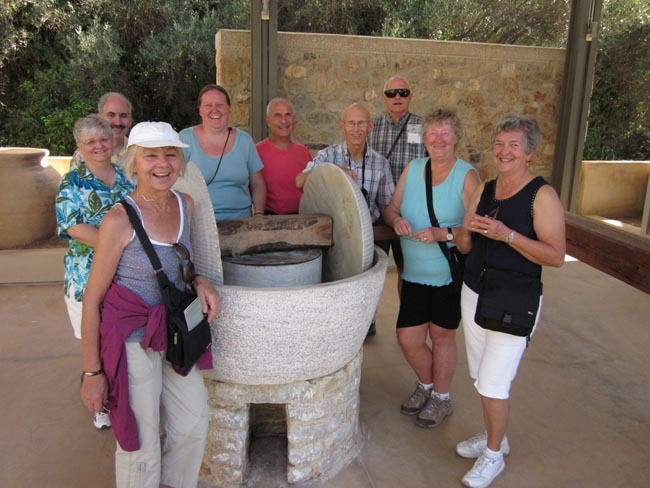 Cheers your neighbour with a warm opa to celebrate a journey with a newfound group of friends who are lifelong learners and equally as keen to explore the world as you are. Enjoy a relaxed pace that allows ample time of exploration with a balance of downtime to reflect on a magnificent days journey. Classical Greece guided tours are dedicated to showing the historical side and soul of Greece, with a focus on having fun in this ancient land. Take in a comprehensive look at the mainland of Greece with a fascinating and in depth tour off all the legends, folklore, and monuments that have made this country famous for several millennia. This was a very positive experience! I learned so much about a country I knew very little about, while having the scheduling of hotels, meals, transportation, and guides taken care of by very competent people! It was professionally done, but with a friendliness I appreciated, I think our tour leader set the tone by her friendliness and positive attitude! Every sightseeing experience was so informative; it is hard to focus on just one most enjoyed; personally I loved Corinth. I liked the monastery visits, too. We were very fortunate as we arrived, for the most part, at sites before the crowds gathered. The local guides were terrific: personable, friendly, informative! Their English was impeccable, too! They were also enthusiastic, and one falls in love with sights presented by such positive guides! We board our coach to drive to ancient Corinth for a brief visit. Back in ancient times Corinth was one of the three major powers in Greece, and took part in all the battles against the Persians. It was from one of the richest cities and this is quite evident by its remains, including the huge Agora (market place) and Apollo's Temple (6th c BC). We continue to Mycenae. The citadel occupies the triangular summit of a low hill between two gorges. The Mycenaeans excelled in this style of building using large, unworked stones. These massive fortifications were begun in the 14th century, followed by Tiryns and Dendra, Argos and Athens, as well as a host of subsidiary forts and eventually, a huge wall across the Corinthian isthmus. The famous Lion Gate, and similar constructions at Gla and Tiryns, were built in the 13th century BC. Here we will see vestiges of a kingdom that, for 400 years (1600-1200 BC), was the most powerful in Greece. We enter through the Lion Gate and see the Great Court where Agamemnon is believed to have been murdered in one of the chambers. Later we travel to Epidaurus, a sanctuary of Asklepios, the God of Medicine. The sanctuaries of Asklepios, the healer god, were as much sanatoria, health farms or spas, as places of worship. This was the most prestigious centre of the cult in the Classical period and received a galaxy of splendid buildings spanning the whole of the 4th century BC. Epidauros came into prominence only in the later 5th century, when the cult was received at Athens in 420 BC and the tragedian Sophocles became its priest. There was a revival at the sanctuary in the 2nd century AD, and worship on the site continued in the form of a Christian basilica. This morning we spend a bit of time exploring the charming seaside town of Nafplio before joining we a dramatic winding mountain drive toward Sparta, arriving mid-morning. We visit the Museum of the Olive and Greek Olive Oil in Sparta, which aims to highlight the culture and technology of the olive and olive production, which is inextricably linked with the Greek and Mediterranean identity. Unique in Greece, the museum is located in the heart of Laconia, one of the main olive producing locations in Greece. 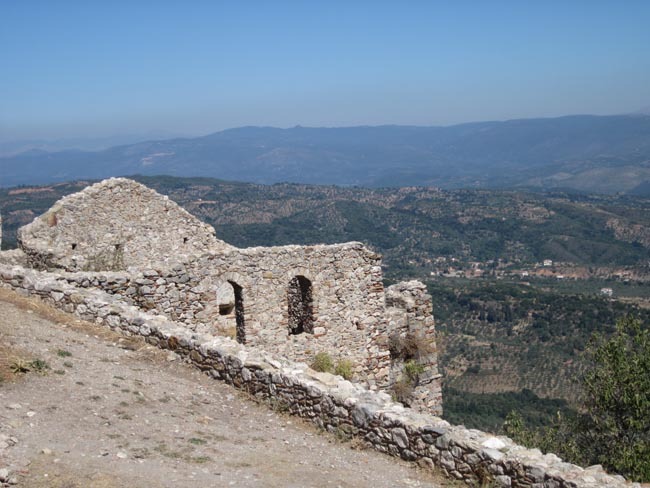 We continue to our tour of Mystra, an impregnable fortress built by Guillame de Villehardouin in 1249. When the Byzantines won back the Morea from the Franks, Emperor Michael VIII Palaeologus made Mystra its capital and seat of government. It soon became populated by people from the surrounding plains seeking refuge from invading Slavs. 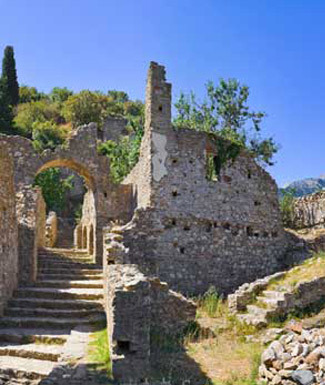 During the rule of the despots, while the empire plummeted into decline elsewhere, Mystra experienced a renaissance, but then declined under Turkish rule. It was captured by the Venetians in 1687 and it thrived once again with a flourishing silk industry and a population of 40,000. It was recaptured by the Turks in 1715, and from then on it was downhill all the way. It was burned by the Russians in 1770, the Albanians in 1780 and Ibrahim Pasha in 1825. Not surprisingly, at the time of Independence it was in a very sorry state, virtually abandoned and in ruins, though since the 1950s much restoration work has taken place. Back in Sparta, you may choose to visit the archaeological remains of ancient Sparta (optional), including the 2nd century BC theatre, the site's most discernible ruin. There is not much remaining of this once mighty civilization, but those interested in Spartan history may find the visit rewarding. Driving from Sparta to Olympia, we arrive in the early afternoon. After lunch we will have a tour of the site of ancient Olympia and the excellent on-site museum. This was a place in ancient Greece where rival states shed their protective armour and congregated in peace to enjoy the ancient games and make offerings to the Gods. The temple of Zeus once dominated the entire complex and housed the 13 m (43 foot) statue of Zeus, considered by the Greeks to be one of the original Seven Wonders of the Ancient World. We will also see the Stadium as well as the Temple of Hera, which is the site's most intact structure. This is the oldest structure in the precinct, originally dedicated to Zeus as well as Hera, and gradually rebuilt from wood into stone. The walls were of mud-brick with a tiled roof. The games, which were the most prestigious athletic event in Greece, were held in conjunction with a festival to Olympian Zeus. Three heralds were sent to all the Greek states to announce their date and declare the universal truce, under which all hostilities were suspended for one week. The games were brought to an end in AD 393, under an edict of the Emperor Theodosius that banned all pagan festivals. The temples were destroyed in AD 426. We drive across the Rio-Antirrio Bridge en route to Delphi, arriving in the early afternoon. On arrival we will have a guided tour of this spectacular site and its excellent museum. According to mythology, Zeus released two eagles at opposite ends of the world and they came to rest at Delphi, the 'navel of the world.' Delphi is known as the center of worship for the God Apollo, son of Zeus who embodied moral discipline and spiritual clarity. But even before the area was associated with Apollo there were other deities worshipped here including the earth goddess Gea, Themis, Demeter and Poseidon, the well known god of the sea. By the end of the Mycenaean period Apollo had displaced these other deities and became the guardian of the oracle. Delphi was the site of the Delphic oracle, most important oracle in the classical Greek world, and it was a major site for the worship of the god Apollo. His sacred precinct in Delphi was a Pan-Hellenic sanctuary, where every four years athletes from all over the Greek world competed in the Pythian Games, the precursor to the Olympic Games. Today we drive from Delphi to Kalambaka. Our route takes us through the central plains, a rich agricultural land often referred to as the "bread basket" of Greece. 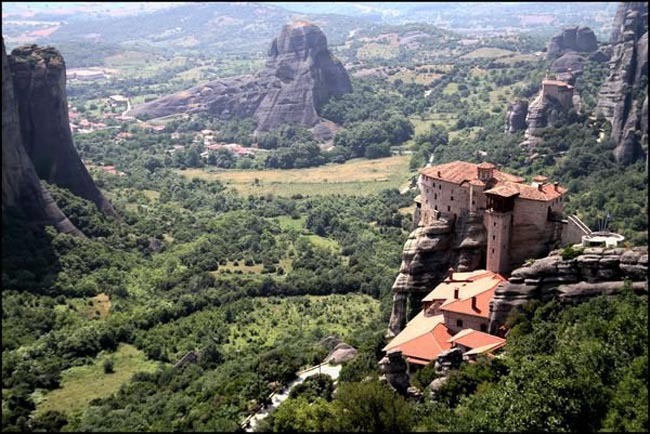 Later this afternoon we have a panoramic drive around the Monasteries of Meteora, built upon rocks that rise vertically from the plains below. These "Rocks of the Air" are visible for miles around and are crowned with old monasteries that cling to their summits. The afternoon light provides ideal conditions for photography; making our roadside photo stops today allow us to spend more time on the sites tomorrow when we visit the monasteries. The Meteora is one of the largest and most important complexes of Eastern Orthodox monasteries and is second only to Mount Athos. 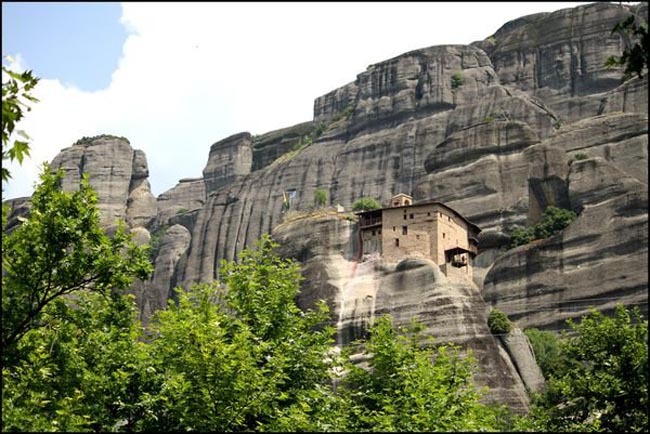 The monasteries are built on natural sandstone rock pillars at the northwestern edge of the Plain of Thessaly. This morning we visit several monasteries* (usually 3 in total; periodic closures determine which ones we visit). Later today we return by road to Athens, visiting Thermopylae, where the great historical battle between the Spartan King Leonidas, the ultimate soldier-king, and the huge army of Persians took place. * Please refer to your pre-trip notes for advice re appropriate attire for today's visits. 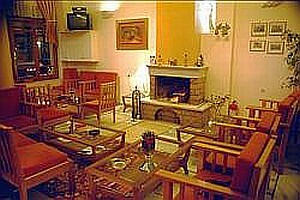 Centrally located right in the heart of Delphi, the Hotel Parnassos is conveniently situated for visiting the famous archaeological site ...	museum (300 meters away). All rooms feature air-conditioning, central heating, private bathroom, TV, hairdryer, telephone. 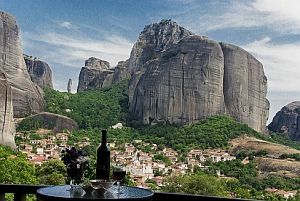 Set on the outskirts of town, this refined hotel is 1 km from the Meteora. Traditional rooms with antique wood ...	feature satellite TV, minifridges, free Wi-Fi, and balconies offering mountain and Meteora views. Breakfast and dinner (mostly local restaurants) daily. All transport, accommodation, sightseeing and entrance fees for sites noted as 'visited' in the detailed itinerary. Gratuities for local guides, drivers, restaurant staff, porters. Airport transfers for land & air customers and for early arriving / late departing land & air customers who book their extra hotel nights through us. International airfare to/from the tour. Tour Leader gratuities, lunches, drinks, personal items (phone, laundry, etc), international (if applicable) air taxes, and excursions referenced as 'optional'. Airport transfers for Land Only customers. Our post-reservation trip notes offer further guidance on optional meal costs and shopping. This tour is offered in spring, summer, and fall, the most popular being spring and fall when temperatures are milder, crowds thinner, and airfares lower. Spring is popular for green landscapes and wildflowers. The region has a Mediterranean climate with early springs, long hot and dry summers, and autumns that are bright and warm into mid-October. Showers are possible in spring, rare in summer, and possible in late fall. Road transport throughout by private air-conditioned motor coach, 24-36 seats depending on ultimate group size (see 'group size'). Greek roads are very good and distances are not great, though we do have some full, though scenic, travelling days. Well-located, air-conditioned, mid-range hotels (3-star) throughout. All hotels have en suite bath, though most have shower only. Porter service is usually available on the mainland (see 'Inclusions'). Single rooms are limited and likely smaller than twins.